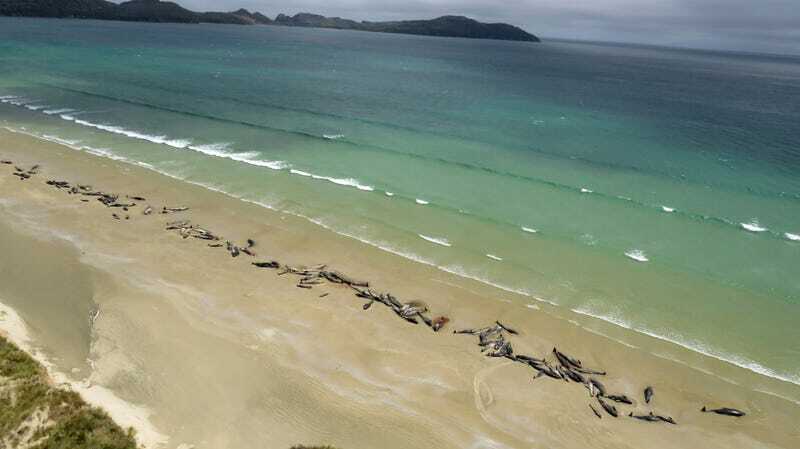 At least 145 pilot whales are dead following a mass stranding at a remote beach in southern New Zealand. The two pods of pilot whales beached themselves over the weekend, their carcasses now littering the picturesque beach. The two pods stranded themselves about 1.2 miles (2 kilometres) apart on Stewart Island late Saturday, according to the New Zealand Department of Conservation (DOC). The grim scene was discovered by a hiker, who trekked to a nearby field base to report the stranding. By the time conservationists arrived on the scene, 75 whales – approximately half the total number – were already dead. Due to the compromised health of those still alive, and the remote location of the beach, the conservationists decided to shoot the remaining whales as a final act of mercy. The incident happened at the southern end of Mason Bay on Stewart Island, also known as Rakiura. Mason’s Bay is located 22 miles (35 kilometres) from the island’s main township of Oban. The island is home to about 375 people, which is located off the southern shore of New Zealand’s large southern island. The DOC has contacted the local indigenous population to discuss next steps, but the carcasses may be left on the beach for nature take its course, the AP reports. The DOC suspects that the whales were beached for an entire day prior to being detected, as some whales were half-buried in sand, and with so many already dead. New Zealand is notorious for whale strandings. On February 10, 2017, for example, 416 pilot whales beached themselves at Farewell Spit in Golden Bay – the worst mass stranding the country had seen in decades. Normally, anywhere from between 85 to 300 whales and dolphins strand themselves on a New Zealand beach each year.